Traditionally, prosthodontic crowns were comprised of porcelain fused to metal. This solid combination is still used by many dental professionals as a simple, cost-effective option. More recently however, the introduction of fully ceramic Procera® crowns have changed the aesthetic appearance of many smiles. 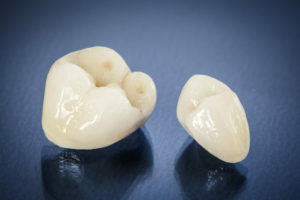 Procera® crowns function in exactly the same way as traditional crowns, but their fully ceramic composition means that the restoration looks far more natural. Unlike the majority of the rest of the body, the teeth do not have extensive healing capabilities. Therefore, once the enamel (or surface) of the tooth is injured in some manner, it does not have the ability to heal itself. Dental crowns are placed to stabilize damaged teeth and permanently prevent the propagation of further damage. Enamel can be injured by trauma, bacterial infections, or decay. Crowns are often used to seal teeth after root canal therapy.